Indian Machine Tool Manufacturers’ Association (IMTMA) organized an Industry Institution Interactive Meet at Bangalore International Exhibition Centre (BIEC), Bengaluru on 25th September 2018. Around 80 participants comprising of academicians, HR professionals and industry experts from various institutions as well as industries turned up for the meeting at BIEC. P.J. Mohanram, Senior Adviser, IMTMA gave the welcome address and introduced the panelists Dr. S. Devarajan, Senior Vice President, TVS Motors and Indradev Babu, Vice President, IMTMA. 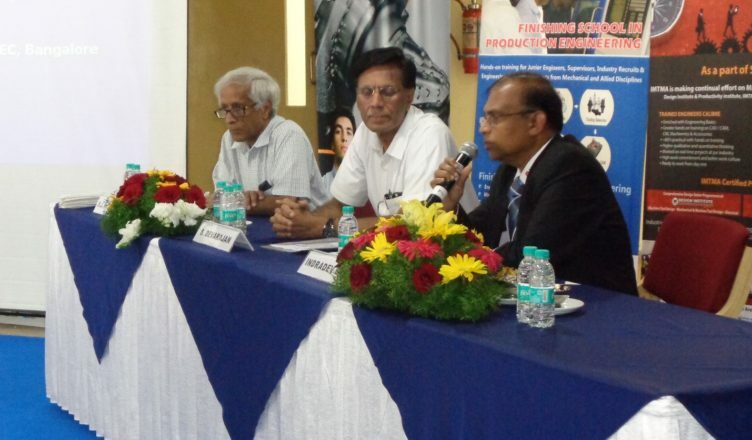 Following the lamp lighting ceremony Indradev Babu gave a talk on the role of machine tool industry in manufacturing. He spoke about the various growth opportunities in store for the manufacturing fraternity. He stressed upon the importance of machine tools in manufacturing. Speaking from his personal experiences he said that he could feel the undercurrent from the recently concluded International Manufacturing Technology Show 2018 in Chicago. The exhibition created a record in terms of participation and there was this huge interest for machine tools. Mr. Babu informed the audience that India was the sixth largest economy in the world and is expected to overtake UK and occupy fifth position in the global list of economic giants. He stated that manufacturing contributes to around 16.7% to India’s GDP. Machine tool consumption during 2017-18 was around Rs.14,700 crores and around 50% of the machines were produced domestically. He added that by 2020 the production figures for machine tools is expected to touch around Rs.12,600 crores. Revealing some statistics he said that auto industry was the major consumer for machine tools. Around 40% of machine tool consumption comes from this industry while industry machinery accounts for around 20%, die and mould industry accounts for around 10%, and defence, railways and power, etc. account for around 5%. With machine tool industry growing at around 20% year-on-year the demand for precision parts and other accessories are expected to increase. Mr. Babu concluded his address by stating that although measured in terms of size machine tool industry may be a small constituent in manufacturing but the sector plays a big role in producing the machines required for manufacturing to happen. Machine tool industry therefore throws open very interesting opportunities for engineers particularly for designing and creating products. Industry produces products with allied services support and institutions churn out educated youth. A proper alignment between the industry and institution will pay rich dividends. Mr. Mohanram made a brief presentation of IMTMA Technology Centres. He informed the gathering that IMTMA lays great emphasis on training industry workforce through its training programmes as well as imparting technology knowhow on advanced developments through seminars and summits. Speaking about the relevance of IMTMA Tech Centres, Mr. Mohanram said that IMTMA has set up model digital manufacturing units at its centres and has recreated a model manufacturing shop where machines are interconnected. The student undergoes training for the job that he would have to undertake on shop-floors when he joins the industry. The training makes them industry ready. Throwing light on the opportunities for Indian machine tool industry Dr. Devarajan said that the machine tool industry has got good design skills and are price competitive. He said that if the industry can design good products for Indian market then we can deliver it anywhere in the world. People would buy. He also added that Indian economy is creating the right opportunities for this and we need to stay tuned. Dr. Devarajan elaborated about how learning and development in enhancing total employee involvement would result in QCD benefits of an organization. IMTMA Director General V. Anbu concluded the morning session by speaking about the current trends in Indian manufacturing. He informed the audience that the vision of Indian government is to increase the contribution of manufacturing from around 16% to somewhere around 25% by 2025. The one-day meet also featured other interesting sessions. 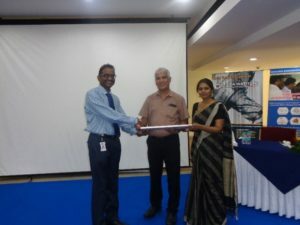 M. Dharmananda, Manager – HRM, Toyota Kirloskar Auto Parts took a session on Best Practices of Learning & Development”. Dr. Prakash Tewari, Dean Academics, KLE Technological University made a presentation on “Faculty Development Initiatives – sharing best practices”. Mr. V. Kumarasubramaniam, Senior General Manager – L&D, Tube Investments Group gave a talk on “How to enhance effectiveness of training?”. Post-lunch the participants were taken for a visit to IMTMA Productivity Institute and Design Institute and interact with the faculty. The final panel discussion on Industry and Institutions examined the skill gap between institution and industry, gave an insight on the expectations of industry from new recruits and examined the role of IMTMA Technology Centre in bridging the knowledge gap between industry and institutions. 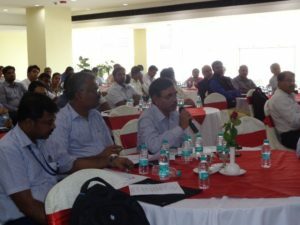 The one-day meet concluded with capturing the training needs in industry.